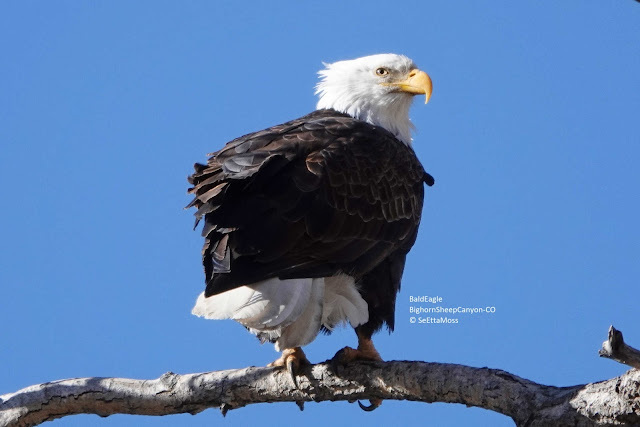 I drove up the Bighorn Sheep Canyon that runs west of Canon City where I live along the Arkansas River two days ago and spotted this adult Bald Eagle perched above the river but not far off the road. I was able to stop and get my photos from about 150 feet away, taking pics from inside my car to avoid risking flushing the eagle. I am pleased to report that after taking pics and driving off the eagle was still perched as it was when I got there.